Continuing my series of publishing extra data from my graduate work (probably only 1-2 more posts left), today I'm going to talk about my favourite experiment I ever did. The standard cellular model for learning and memory is that memories are stored in the synapses between neurons, and that learning changes the strength of these synapses. While this model makes sense, no one has actually been able to measure the strength of a synapse while an animal learns. However, you can use spine size as a proxy for synaptic strength: among other things, bigger spines have more AMPA receptors and stronger synaptic currents. If you image spines while animals are learning you can see all sorts of changes in spine number, and watch spines be created and destroyed. Since spine size is correlated with synaptic strength, and synaptic strengths change, Haruo Kasai theorized that a spine's size actually represents the stimulation history of a synapse. That is, a small spine represents a synapse that is either newly formed, or has been depotentiated; and a large spine represents a synapse that has been repeatedly potentiated. There are lots of cool questions you can ask if this is true, like whether there are a discrete number of spine sizes, or if spine size is graded; and whether there is a continuous, random process of spine shrinkage that allows us to form new memories. If a spine's size can represent its stimulus history, this implies that a spine/synapse can repeatedly change size. Some people have tried to test this using a minimal stimulation technique, but because they could not identify the synapse they were recording, the results are not 100% conclusive. 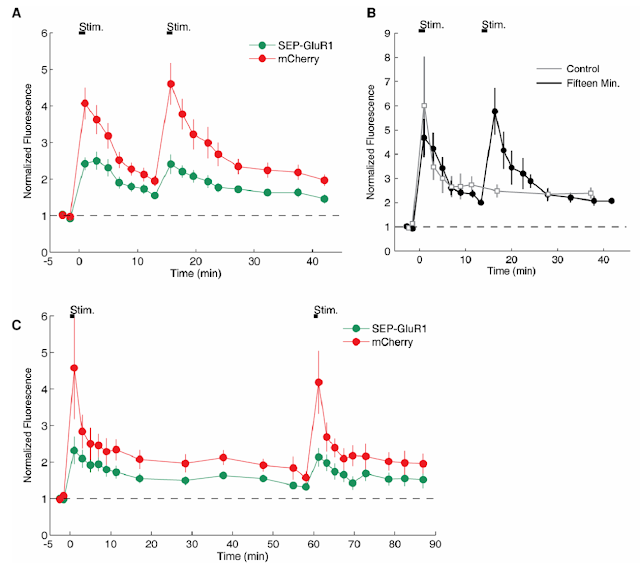 Another group used glutamate uncaging and found that synaptic strength changed in a step-wise fashion, but did not stimulate twice. Two-photon glutamate uncaging allows you to address this question. You can measure a spine's size (i.e. synaptic strength), and stimulate it with glutamate to cause an increase in spine size. Stimulating a spine increases spine volume. Neurons are transfected with fluorophores so you can see them. Before stimulation (top row), spine are relatively small; one minute after stimulation, they are much larger; 30 minutes later, their size has relaxed, but is still larger than originally. From Patterson et. al. 2010. Stimulating the same spine twice does not cause growth beyond the first stimulation. A. Double stimulation at 15 min. interval. n=11 spines, 10 cells. B. Paired spine structural plasticity. n=5 pairs. C. Double stimulation at 60 min. interval. n=8 spines, 7 cells. There is a lot of variability in the transient phase of structural plasticity (<5 min), so it's best to look at structural plasticity after 30 min. To do this, I uncaged on nearby "control" spines (panel B). 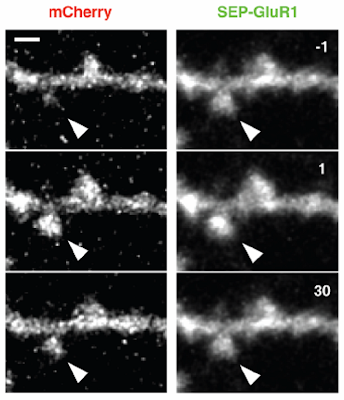 If you compare the structural plasticity for the two spines at 30 min., you can see they're basically the same. So that's at 15 minutes, what about longer time intervals? I repeated the experiment with a 60 minute interval, and saw the same basic result: following the second stimulation, there was no obvious increase in structural plasticity, for both the transient and sustained phases (panel C). So how do I interpret these results? First, I think this shows that structural plasticity has a refractory period; that is, once a synapse changes strength, it is stable, and cannot be changed again for a while. How long this refractory period lasts is a great question, and could be a limiting factor in memory formation. I tried stimulating twice with an interval of 24 hours, but the slices got contaminated by bacteria. A second interpretation is that structural plasticity is saturable. That is, the capacity for change has a limit at any given time point. Note that this does not really address the question of whether spine sizes are distributed over a continuous space, or discrete sizes. What I really love about this experiment is how simple it is, and how many different directions you can go from here. And it was all enabled by new technology.